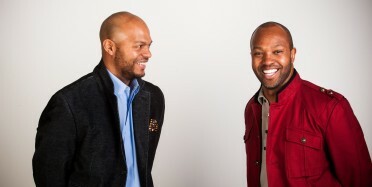 From small town roots to award-winning careers in the National Football League, Terrence and Torry Holt know what it takes to win. But it hasn’t all been easy. Hard work, determination and a competitive spark made them who they are today. As young children, they also experienced the unthinkable — their mom was diagnosed with cancer. Her treatment and their fears for her future dominated their young lives. After their mom passed away, the brothers started a foundation in her memory to support young kids with a parent with cancer. Since their retirement from the NFL, Terrence and Torry have moved back to Raleigh, NC with their families to start a new phase in their lives. Their company, Holt Brothers Inc., consists of Holt Brothers Construction, Holt Brothers Development, Holt Brothers Football, and the Holt Brothers Foundation. Their goal is to create a thriving company that provides jobs, grows the economy and benefits the greater good … and matches their success on the football field.